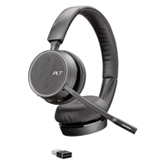 Plantronics Voyager 4220 Bluetooth stereo USB headset with BT600 USB-A Bluetooth dongle. Plantronics Voyager 4220 is a true Bluetooth office headset noise-canceling flexible microphone. to block unwanted background office noise. Class 1 Bluetooth providing 100ft of range when used with the Bluetooth BT-600 adapter (included). Controls on the headset allow easy switching between PC (or Mac) and your mobile device. Red "busy light" on the headset shows your co-workers you're on a live call.